Pilots working for the travel group Thomas Cook have called off eight days of strikes that had been planned this month, the Balpa union has said. The strikes were cancelled after the two sides agreed to enter binding arbitration to resolve a pay dispute. It means that a strike planned for this Friday, a three-day strike from 12 October, and a four-day strike from 19 October have all been called off. The dispute is over a 1.5% pay offer, which Balpa has said is unreasonable. The union says it wants a rise in line with inflation - currently running at 2.9% on a CPI basis - and better travel facilities. A strike on 8 September was the first by pilots at the company since 1974. "I am pleased that we have been able to find a peaceful way of resolving the pilots' pay dispute without further disruption to passengers," said Balpa general secretary Brian Strutton. 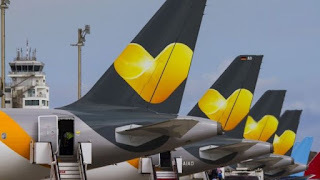 Thomas Cook said: "We remain keen to resolve this dispute in the interests of all involved and we will now focus on proceeding with the arbitration process." The travel group said it had changed some flight times for Friday because of the planned strike. "We'll be keeping to these revised departure times," it said.